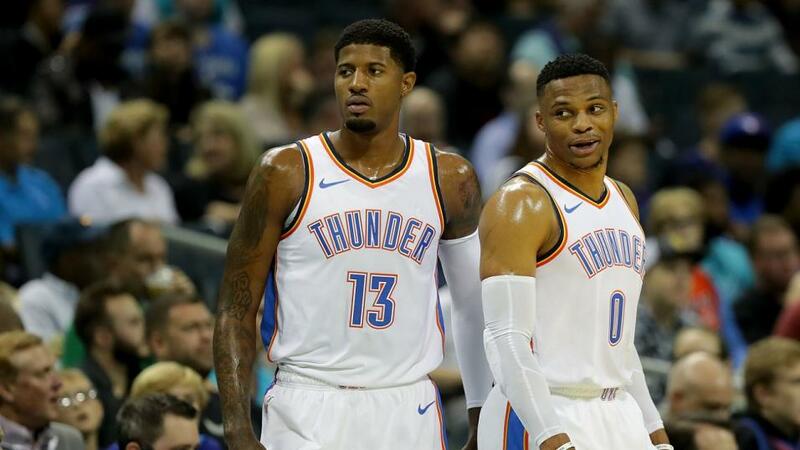 "In typically unpredictable style, Oklahoma City rallied as the season drew to close to undo some of the damage seven losses in nine did through mid-to-late March. Most importantly, they managed to avoid a clash with the Warriors in the first round, a fate that looked very likely prior to their final five wins." Once again this season, the Trail Blazers did what they usually do. A steady opening was followed by a steep improvement after Christmas as they went 34-14 to finish the season third in the brutally tough Western Conference. Though maybe they finished the season a little bit too well. They've won three straight and 11 of their last 13 games, meaning they hopped over Houston on tiebreakers after their final win over Sacramento to land that third spot. Before that, they looked set for a series with the Jazz as fourth v fifth seeds. Now, they've got to take on the OKC rollercoaster instead. We've covered the Thunder's troubles of recent weeks. In typically unpredictable style, Oklahoma City rallied as the season drew to close to undo some of the damage seven losses in nine did through mid-to-late March. Most importantly, they managed to avoid a clash with the Warriors in the first round, a fate that looked very likely prior to their final five wins. Paul George's possibly limited play due to a lingering shoulder complaint is a minor concern, his average of 28 points per night was second only to James Harden's spectacular scoring feats, but he's expected to play at least. The Blazers have done well to weather the Jusuf Nurkic injury and have the depth to cope with the strain on their roster, but we've seen them romp into the postseason before and then fail to deliver. The Thunder unlikely surge into the sixth seed looks almost too well scripted for another Oregonian first-round exit at their hands. OKC won all four of the games between these two teams during the regular season, which makes them getting +3.5, even on the road, very appealing. The Thunder on the handicap is the clear choice in this, even if George is in doubt, at [1.91]. Opening Sunday's slate of game, the Indiana Pacers might wish they had a couple more weeks of regular season dawdling to find some form ahead of a showdown with the Celtics. The series underdogs lost nine of their last 13 games to finish the season. It's still an achievement to get the fifth seed in the East after losing Victor Oladipo in the middle of the season, though looking at those who finished behind them, it's not exactly time to break out the champagne either. They almost held fourth, which would've given them home advantage in this series, but that final run of games saw the Midwesterners slip behind the Celtics and lose what could've been a crucial edge. Boston closed the season heading in the opposite direction. They won six of their last eight to round off what has been a rocky season with a glimpse of their true potential. Last season, they really should've made the NBA Finals, and they were healthier this season but it never seemed to click. They still have time to recapture the form that took them to within one home game of the season finale with the Warriors. Indiana ought not to cause a problem in this round, thought the absence of Marcus Smart, likely for the first two rounds of any playoff run after picking up an injury last Sunday against the Magic, could be felt as he is one of Boston's bigger presences on defence. The Celts won the regular season series between these two 3-1, and delivered a 20-point pounding against coach Nate McMillan's team just over a week ago, but two of the other three encounters were settled by one and two points each, including the Pacers last visit to TD Garden on March 29. I'd still expect the home team to win, but I'd rather bet on the visitors getting 7 points or more at [2.00]. Both of these teams are really on a tear as they charge into the playoff fray and this could be one of the best series' of the first round. James Harden has put up an incredible defence of his MVP crown. His name is being mentioned alongside all-time greats like Wilt Chamberlain and Michael Jordan thanks to his otherworldly statistical performance - seven 50+ games in a season, over 2500 points, 500 assists and 500 rebounds - this has been a season that'll be remembered. A rising tide does lift all boats though. The fact that scoring is surging across the league is one reason that he seems likely to miss out on a second consecutive best player award despite the numbers. The other is that the Rockets have fallen to fourth seed this season after winning the West last campaign. It means they now face the in-form Jazz in what'll be a very close series if their recent play is anything to go by. Utah have won eight of their last 10 games. In that run, they've won by 18 points on average. They had to adjust to a very tough opening schedule and rule changes that affected their defensive style of play from last season, but they coped with those issues and improved their scoring - they're right up with Houston in terms of points-per-game in the closing stretch, so they won't fear the beard too much in this series. Their defensive play ought to concern the Texan team too, with the visitors limiting teams to 32% shooting from outside in their recent run. Given Harden's three-point tendency, that could be a crucial stat in the series. The Rockets are also playing very tight though. Six of their last 10 went under. They've limited opponents to 109 points on average for the season and have turned the screw even more in the closing month or so. Also, three of the four meetings between these two hit the under, so it's worth taking the 10/11 on offer for fewer than 214 points in this opener.